Work continues to go well. Lots of work and still a very steep learning curve though I'm starting to realize that may be more of a constant given the ever evolving dynamic in the industry. The people are great, I get to wear jeans and listen to Pandora at work and we have Fridays at 4, what can best be described as an internal happy hour. As part of work, I'm finally having to embrace the "social media" space. For those of you less tech literate in the reading audience, I'm talking about Facebook, MySpace, YouTube, etc. I'm jumping in the shallow end and added a Facebook account to the arsenal. I need to go buy our social media guru a beer to have him show me how it works, but it is a start. On the slightly deeper end, I joined Twitter. What is Twitter? Well, it is either a form of microblogging that allows someone to quickly update their "followers" on what is going on or it could be the biggest waste of time ever. The jury is still out but an article on Twitter's founder Evan Williams is worth the read. Looking forward to going from Mt. Hood to Palo Alto in approximately 4 hours on Friday as I go from Anvil's quarterly field trip to the airport and then on a plane to celebrate Becca's grandmother's 90th birthday. Ok, back to work/school. Hope all is well! I actually had a couple of musings that I have been wanting to work on and post, but for once real life - or at least work - has gotten in the way. After the success of my last project which involved flying around to speak with electrophysiologists in different cities, I was assigned another similar market researchy type job. This subjects of this one however are the company's regional managers and sales reps and instead of in person interviews, I'm trying to cram 30+ phone interviews into a week. This in itself would be no big deal, but a) the field force is by the nature of its job very busy and not necessarily able to keep appointments, and b) there have been some some technological challenges. Just like with the physicians, I am taping these interviews so that a transcriber can write up the interview for me resulting in a) better notes, b) more chance for me to focus on the discussion and c) the ability to pull out verbatim quotes. This was easy in person, I just put the digital recorder on the table between us. And theoretically it's easy with a phone too. Radio Shack sells a cheap splitter that allows the feed to go directly to the recorder as well as your hand set. Unfortunately, here at Davis central we only have cell phones. 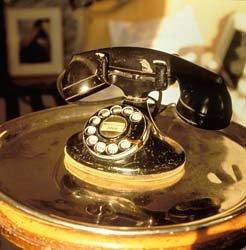 It made more sense last year when we didn't have a 'for real' home and even now that we're a little more settled we don't see any reason to add a landline. (The few faxes I have to send I can do at the corner UPS shop.) I'm sure once there are children and babysitters etc. involved we'll get one, but for now it's solely cells. This has led to a rather ridiculous looking technology solution. I have the dig recorder on the desk or up on a stack of books on the desk. Next to it is my cell phone, perched on its side so that the speaker on the back is going straight into the recorder's microphone. Then, because I've found they can't hear me clearly if I don't, I kind of lean/hunch over so that my mouth is down by the cell phone's microphone. I'm sure I look like some sort of demented Igor while doing these interviews, but it gets the result I'm looking for. Going on our around the world trip has changed our lives in both huge and subtle ways. But one of the most pervasive things it has done is to open up our minds to the possible. Growing up and through my first jobs and grad school, I couldn't imagine myself just walking away from job, career, and societal "responsibilities" to do something entirely for us and to carve out so much time just to live life. I would envy and admire other people who did it, but the idea of me -- 22 going on 40 ME -- doing it was inconceivable. After having actually made the break and having gone on our trip however I find that there are very few things that are 'inconceivable'. You may have seen the story below on CNN a few days ago. Reading it a few years ago I would have been impressed and admiring, but the experience itself would have seemed as foreign and out of reach as a vaction on Mars. Now I read this and say, "why not?". We've awakened a wander-lust that we will continue to listen to (check this space soon for details of our next trip in April) and I hope that when our kids are settled we would still have the good health and energy to do something like the Patterson's did. Why shouldn't that be us? 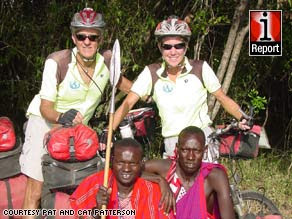 In 2002, at the ages of 62 and 48, Pat and Catherine Patterson decided to leave it all behind. They sold their real estate business and their cars, gave their furniture to their children, and put their home up for rent. Strapping their remaining possessions to two bicycles, the couple set off to bike around the world. Fifty-seven countries, four continents and almost four years later, the Pattersons look back on their journey as something no less than life-changing. 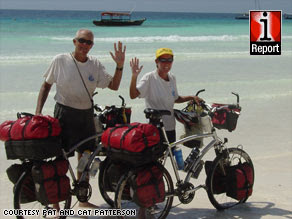 Between 2002 and 2006, the Pattersons biked from California east across the United States to Greenland, through Europe and Russia, down Africa, then from southern Chile all the way back up to California. They biked about 50 miles every day, which Pat says, "Isn't a lot if that's all you do." They stayed in hotels most of the time, for the sake of safety and comfort, but they biked with camping supplies in case the need arose. They planned their routes using only maps and Lonely Planet travel guides. They assessed the safety of their surroundings by talking with locals. "Gather a consensus of opinion; ask three times. Ask, ask, ask -- we did," Pat says. The trip wasn't seamless. They were robbed of their computers once, and another time they were held up at gunpoint. In Finland, it was so cold they eventually had to give up biking and fly down to warmer weather in Portugal. "I never in my wildest dreams thought that I would do something like that in my life," Cat confesses. "I think you just have to be open-minded and willing to take chances and risks and not be afraid. ... You just have to open your mind to other cultures and countries and, you know, like Pat says, 98 percent of the people in this world are good people. On a day to-day basis you're meeting the average person in the world and they're just like you." Excerpted from CNN.com. Click here for full story and more pictures and a map. I think what Cat said is the key to why we are so much happier now than before: "You just have to be open-minded and willing to take chances and risks and not be afraid..."
Easier said than done, but once done, you'll find it's so much easier than how you used to live. So, we have a new entry for the annals of "what are the chances of that??". We were out house shopping last weekend at a nice place for sale by owner and spent some time talking with the guy. Turns out he's selling the house because his family is moving back to Switzerland. 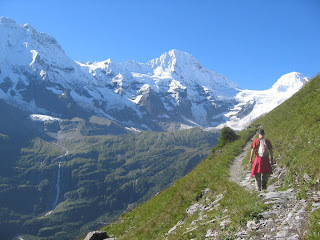 Further, it turns out that they lived/will live again more or less "just around the corner" from one of our favorite Swiss spots and are well acquainted with the Lauterbrunner valley and the Mountain Hostel in Gimmelwald (one of the highlights of our whole around-the-world trip). That was a nice little connection, but not so weird in-of-itself as Gimmelwald has quite a following among the traveling (and rick steves) bunches. But then we got his phone number to follow up with. Quick aside: Brian and I got our cell phones last September. You know how the process goes: they enter your information and then the system picks out the next available number and assigns it to you. Well, Brian's info went in and his number ended in x598. Then they put mine in and I was assigned the same number, but ending in x601. So they were actually very close to each other, even though the last four digits didn't share many numbers.